Once your pool is remodeled, you’ll notice that the entire yard looks more inviting. You’ll also be more comfortable inviting friends and loved ones over to enjoy the pool with you. Whether you want to remodel the pool area to make it safer or you want to update the look of your home’s exterior, here are a few suggestions and pool remodeling ideas to consider. Creative and colorful lighting in your pool space is both practical and appealing. Of course, the lights make it easier to see when you want to spend time swimming or wading in the evening hours. Lights can be installed at the border of the pool to make the water look even bluer. Or, you can install lights on the pool deck so that you can safely walk from the seating area to the pool. Overhead lights at the corners of the pool can also add warm lighting to the pool space. Artistic fences and borders are an attractive part of a pool remodel as well. Stone structures that are built around the pool are beautifully modern. If you decide to have a fence erected around the pool, you can select a metallic shade that matches the rest of your outdoor furniture. Planting vine plants around the fence so that the leaves will grow upward makes the fence look like it’s made of plants. This a great way to add more plants to the yard while protecting the pool. Rock structures positioned around the pool and rock gardens are one of the best ways to make the pool area stand out. 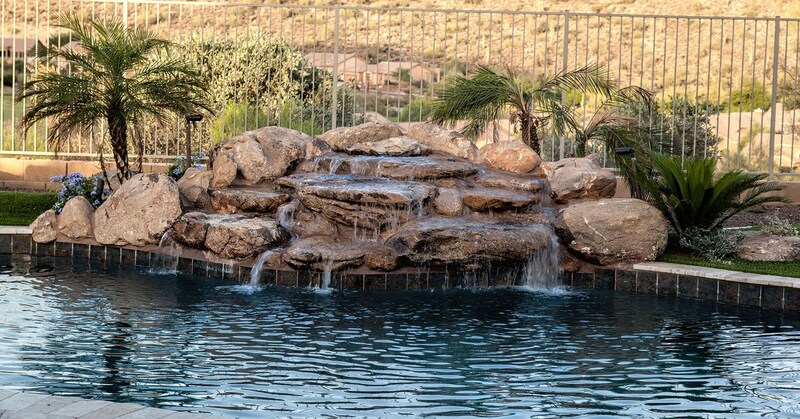 A rock structure can also be positioned in the pool to create a waterfall. Rock gardens combined with sand patterns are relaxing and help to add texture to the yard. The garden also pairs well with grassy sections of the lawn. The deck around the pool can be remodeled to make the pool safer and attractive. Large concrete tiles provide modern, clean lines. These tiles can also provide a beautiful contrast with the blue water of the pool. While concrete is traditionally gray, you can choose from a variety of hues to make the pool area unique. Brick can also be used for the deck and the border of the pool for a uniform look. Changing the shape of your pool is a great remodeling idea as well. If your pool is round or rectangular, changing it into a square shape or adding sharper lines is a modern touch. Pools that open to one side to lead to the wading pool or spa as well. Depending on the shape of your yard, you can also select a triangular pool and add plants or flower borders for more visual effect. No Limit Pools have a team of the some of the best pool remodeling contractors Arizona has to offer. Our expert team knows what it takes to make your pool area one of the most attractive parts of your home. We listen to your needs and concerns to make the pool remodeling process as seamless as possible. Whether you want to change the shape of your pool, add a spa or need landscaping ideas, we’ll help you find exactly what you’re looking for. When you’re searching for pool remodeling Mesa, AZ services, look no further than No Limit Pools. For more information, pool remodeling ideas and to set up a consultation, contact No Limit Pools. This entry was posted in Pool Remodeling, Uncategorized. Bookmark the permalink.